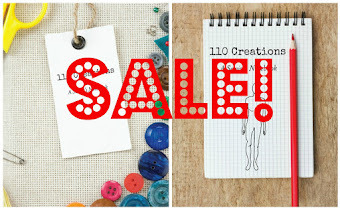 110 Creations: Pink! Ponte! Blazer! 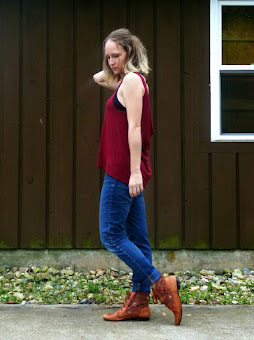 All the titles I could come up with for this post were lame, but somehow lots of exclamation points seemed necessary. Why? Because this post contains all of my favorite things! Pink, of course. 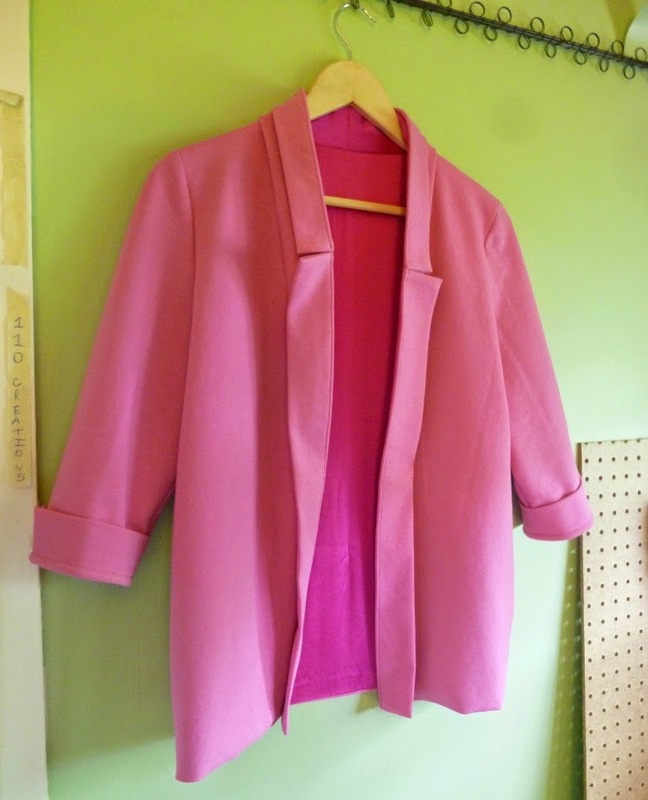 A new pattern (By Hand London Victoria Blazer). Knits. A success story. 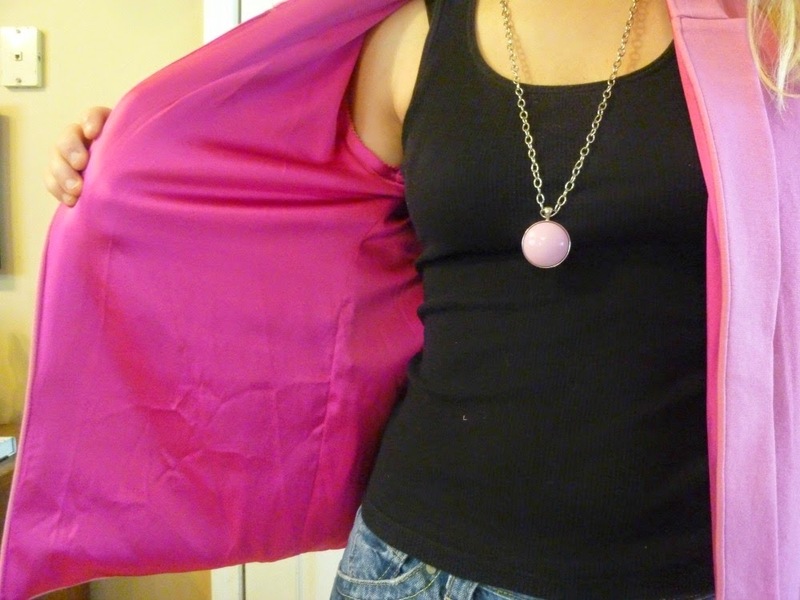 And a new favorite thing, silk! 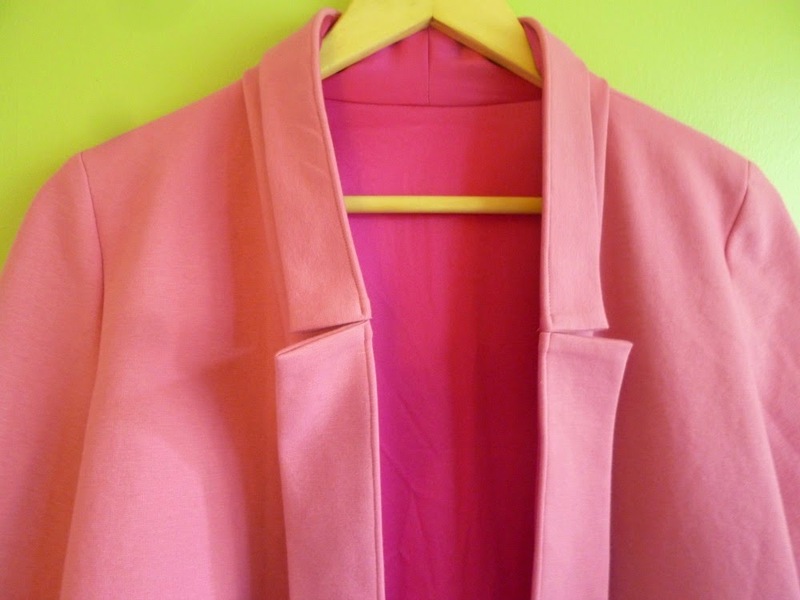 A pink ponte blazer has been weighing on my mind for quite some time. 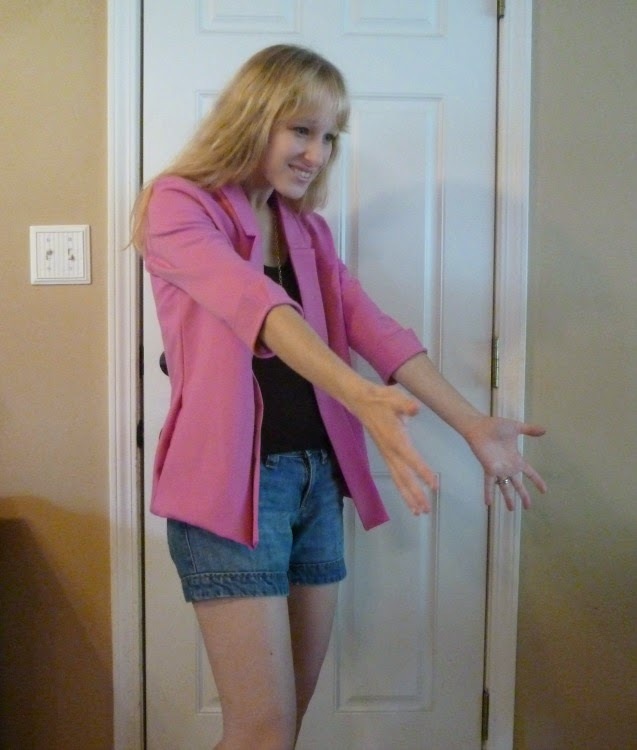 Pink is one of my colors for my spring/summer wardrobe, and I own exactly 0 blazers. I managed to find the perfect fabric and then mysteriously only ordered one yard. 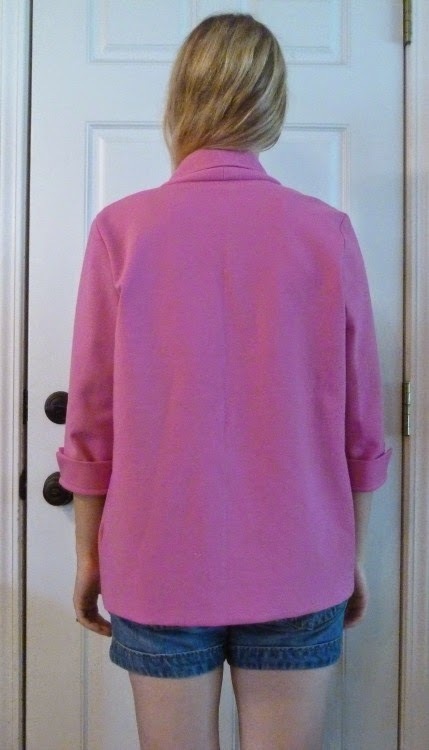 I tried Butterick 5926 which ended in a failure (in a BLAZE of glory you might say). It seemed like the project must be doomed. But I couldn't get it out of my head. 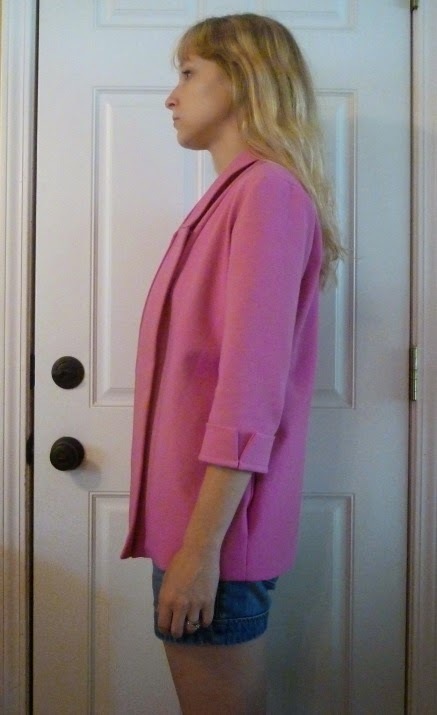 A partial lining (the sleeves are unlined), a simple collar and separate lapels, an oversized fit, three-quarter length sleeves, and a clever dart; the pattern has all the things that will make sewing a blazer easy. And trust me, it was as easy as it seems in the sewalong. 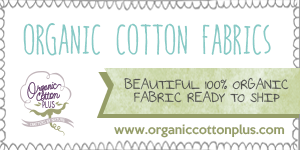 The fabric is a 100% cotton ponte (try finding THAT online!) from Mood. It's the perfect weight for a blazer. As I said, I accidentally ordered only one yard, but I managed to order another and make my blazer from two 1-yard cuts. The pattern is intended for wovens but ponte or another stable knit should work as well. And just look at that lining! It's a stretch silk charmeuse, also from Mood, which was one of their 50% off daily sale fabrics a few weeks ago. I had been agonizing over what to use as a lining (another knit? a woven? no lining? what color?) and as soon as I saw this beauty on sale, I knew it was meant FOR ME! The internet is surprisingly quiet about what to use as a lining when using a knit for a shell. Due to the oversized fit, the stretch factor wasn't terribly important, and I found that these two fabrics worked really well together. 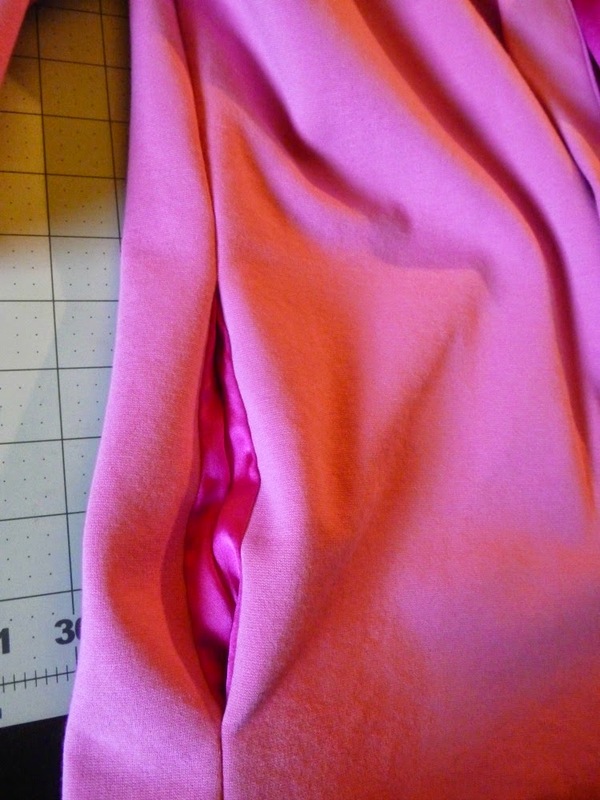 I had never sewn with silk before, and was VERY nervous, especially since it contained lycra. All I could hear was Dimitry from Project Runway saying that charmeuse was the hardest fabric to sew and all your mistakes will show. Well, one of my mistakes certainly shows, I accidentally clipped a damn HOLE in the lining near the armscythe. Cue copious weeping. Anyone know a good way to fix that? I did prewash my silk using this method. When the silk was almost dry I tossed it in the dryer on low for a final fluff. I doubt I'll be washing this blazer but I wanted to be prepared. 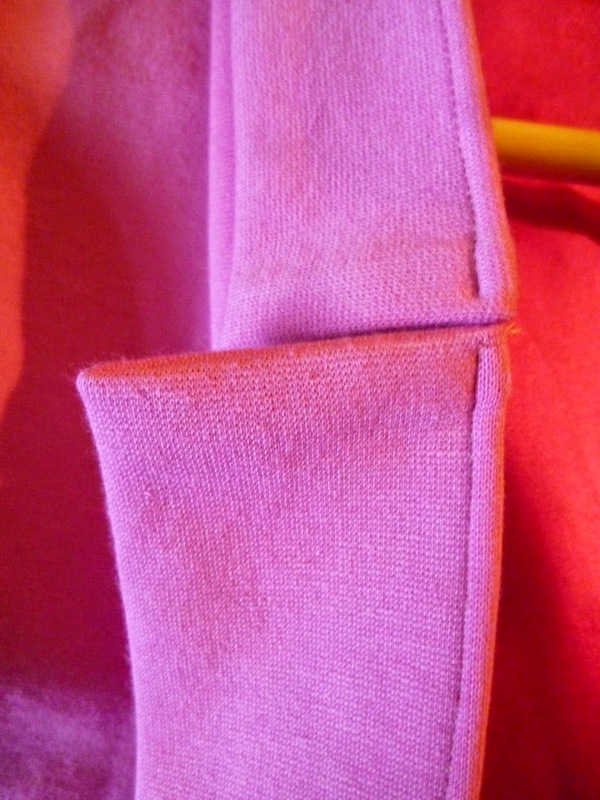 Also, I used pins in my silk and not just in the seam allowances. 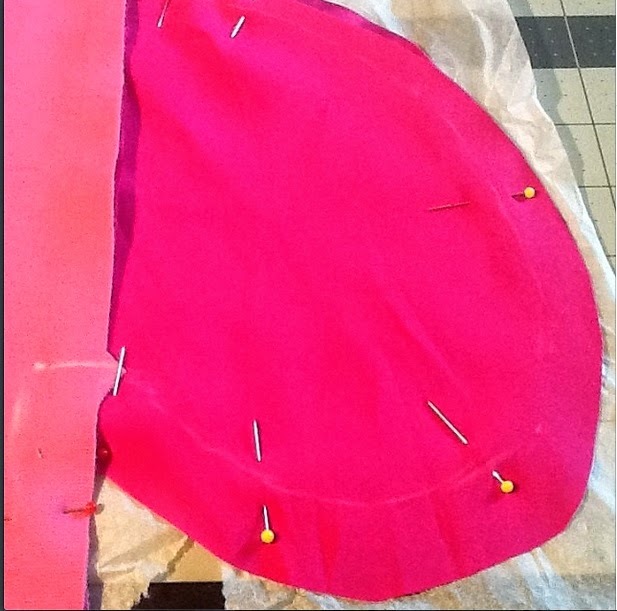 As I said on Instagram, I hope the sewing police don't come to get me. I found sewing the pocket bags to be the most difficult. Two pieces of charmeuse on a curve? No fun. I had to use tissue paper to stabilize the area while sewing. But they look cool peeking out of the side seams. I have a lot of tips for sewing this up, enough that I thought it warranted a separate post. So stay tuned for that! Action shot: "hey AB come here!" You can see that the lapels are twisting and pulling the blazer open. It's a complaint I found in other reviews, and the instructions recommend that you tack them down. I tried that, but it was hard to sew and wasn't working and looked stupid anyway. 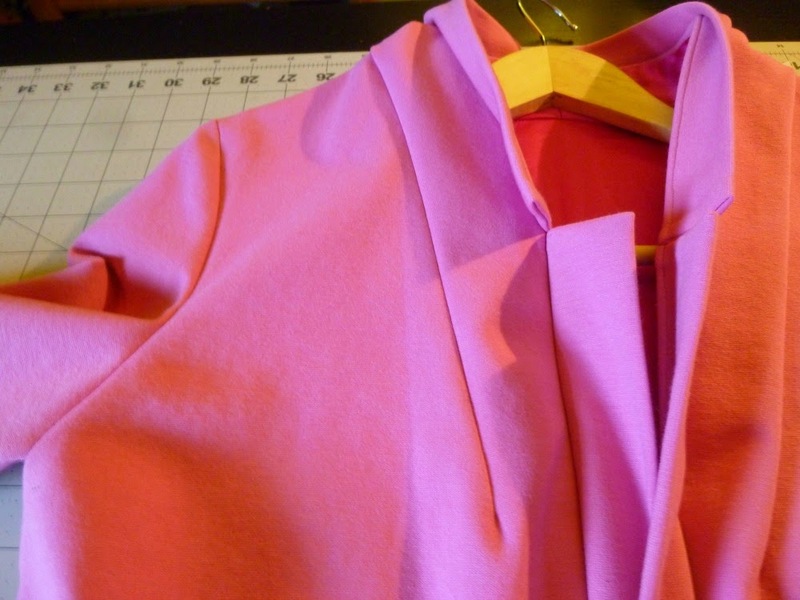 I decided that flapping lapels were going to drive me batty and that it would be better to topstitch everything down. You may not have this problem if you work with a thinner fabric. 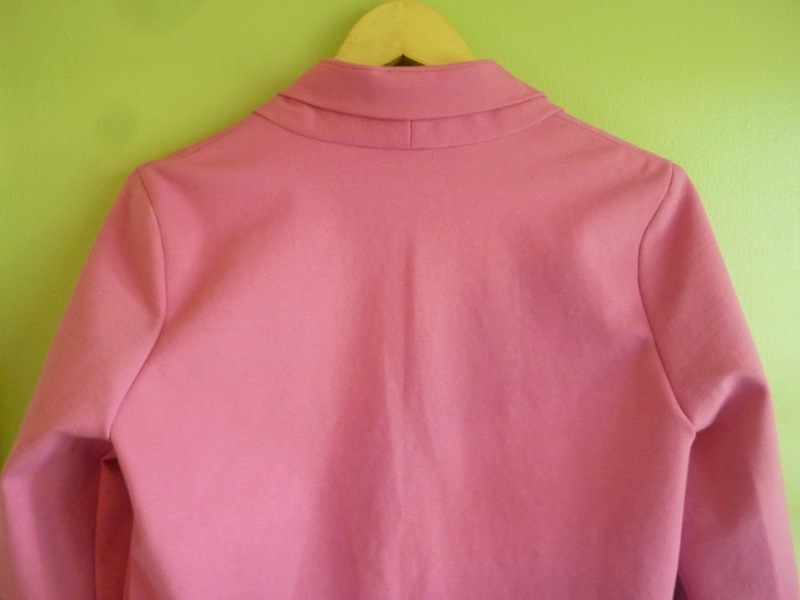 The ponte is fairly thick, and the seam allowances in this area are bulky, which caused the lapels to roll a bit. After topstitching, my fabric looked a bit stretched out, I'm not sure if you can see it in these photos or not but it's something to consider. Do what makes sense for your fabric. 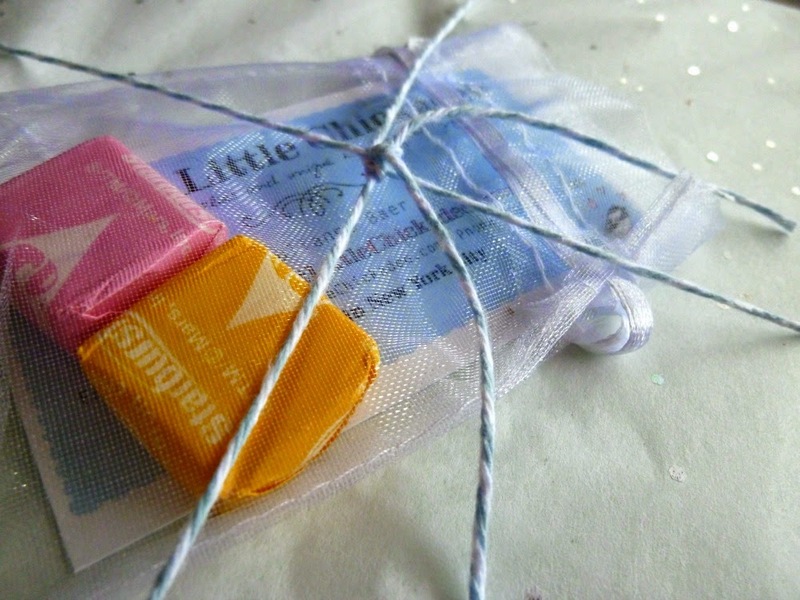 I made the smallest size in the envelope and it's pretty loose on me, although the sleeves fit well. The pattern is easily the most expensive one I've ever bought, but with 3 views I think it will be worth it. I particularly like Sally's cropped one, and a sleeveless version would be fun as well. Next time I might try to curve the side seams for a little more definition/shape. I imagine you could also add fisheye darts to the back for the same reason. 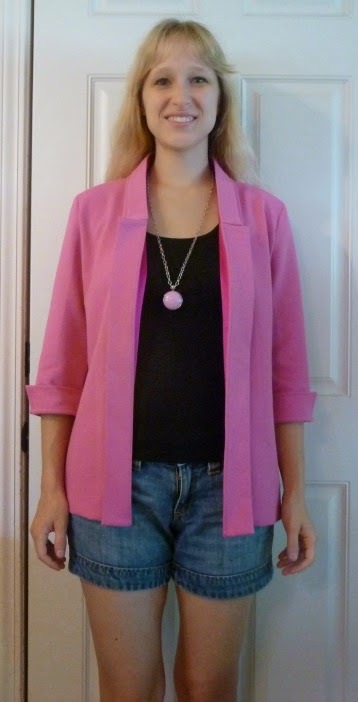 I finished this blazer just in time for the 90 degree weather to hit our area, but I'm taking it with me this weekend to the Original Sewing and Quilt Expo anyway. This time of year, you have to go from extreme heat to extreme air conditioning pretty constantly, so it helps to always have a cardigan or jacket around. Wish me luck at my first sewing convention and I'll be back next week with all the details! What a lovely color, the blazer looks great on you. I would just close the hole with tiny handstitches, since it won't show. I hate when that kind of thing happens. Enjoy the show - I look forward to your report on it. Luckily the silk doesn't fray like crazy, so a few hand stitches will probably do the trick. Thanks! I just started working on this pattern last night for my next Fabric Mart post. I'm making the cropped version and it's striped so it took me a whole evening just to cut the fabric because I'm a perfectionist. 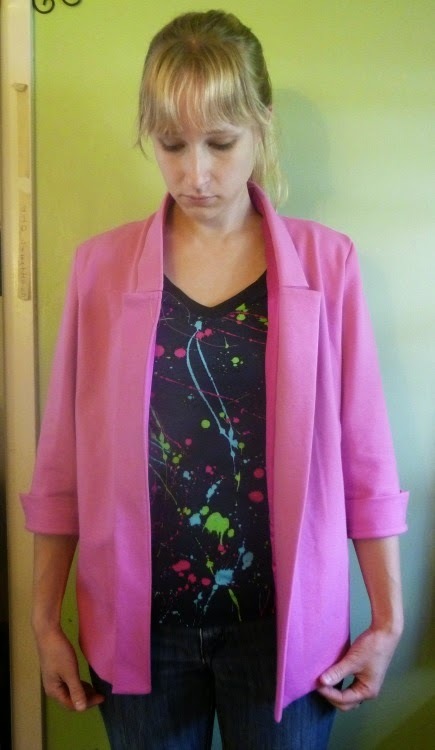 I don't know why it's never crossed my mind to make a pink blazer but it should have. Love yours!! As for that tiny hole if it were me I would just hand sew it shut, maybe put a little fray check around the edges just for good measure. 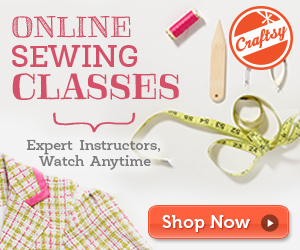 So sad I'll be missing out on the sewing expo :( Maybe next time! Looking forward to your report on that. Ooo can't wait to see your version! Sometimes I like stripes because it's easy to sew straight with a visual, but cutting out is such a pain!